A nuclear reactor in Maryland was shut down because of wind damage, while others were either taken offline or operating at reduced capacity as winds and rain lashed the east coast of the United States during Hurricane Irene on Sunday. The hurricane topped a troubled week for nuclear reactors in the eastern United States after a 5.8 magnitude earthquake last Tuesday caused a power outage at Virginia’s North Anna nuclear power plant, forcing it to run back up diesel generators to cool its cores. One of the four generators failed after the offsite blackout, which was cased by transformer problems. Following Fukushima Daiichi, the American nuclear industry was on high alert after its own local quake and the threat of high sea surges that were predicted to accomany Hurricane Irene. But the US East coas was spared a repeat of the giant tsunami that hit Japan on March 11, causing three nuclear meltdowns at Fukushima Daiichi nuclear power plant, floods of highly irradiated water, explosions and ongoing spews of radiation. During the hurricane, a reactor at the Calvert Cliffs nuclear plant in Lusby, Maryland, remained off-line on Sunday after going into automatic shutdown when a piece of aluminum siding ripped from a nearby building damaged a transformer. Constellation Energy, which operates the Lusby plant, said the facility was safe and that a second reactor was operating at full capacity. No power outages resulted from the shutdown. The Maryland state emergency agency said the plant would reopen after inspection. “[The] number one [reactor] will stay offline until they have folks that will crawl over every inch of it,” the agency’s spokesman, Quentin Banks, told the Guardian. It was the second complete shutdown caused by Irene, after authorities took a plant offline in New Jersey as a precaution before the storm. The plant owner is waiting to resume output after on-site inspectors complete a safety assessment, Suzanne D’Ambrosio, an Oyster Creek spokeswoman, said yesterday. Dominion Resources Inc.’s Millstone nuclear plant, which sits on a peninsula in the Long Island Sound, was spared the storm’s fury as Irene took a westerly track, said Ken Holt, a spokesman for the plant. Dominion didn’t needed to shut down the two reactors at the plant in Waterford, Connecticut, which are operating at about 50 percent, Holt told the Bloomberg news agency. The plant didn’t get winds as high as had been predicted, Holt said. ‘‘It doesn’t seem as bad as we’d expected,” he said. Indeed, the storm, which received rattling media coverage before it made landfall in North Carolina, made its strongest impression in that state with 194 kilometer-an-hour winds, but did not make a significant impact on the 14 nuclear power plants that lied in its path. NRC emergency staff had been sent to each of the plants. The hurricane was downgraded to a tropical storm as it pushed its way into New England. The New York Public Transit Authority had shut down all subways, busses and commuter rail trains for the first time since 1936. Bridges into the city were also closed for wind gusts. New York City mayor Michael Bloomberg had ordered the evacuation of some 370,000 people in low lying areas of the city such as Battery Park on Manhattan’s tip, Coney Island in the borough of Brooklyn and Far Rockaway in the borough Queens. Instead, however, many decided to hit the beach for excellent surfing to the dismay of police and lifeguards. Many Massachusetts residents – who had expected more – likewise, took a jeering approach to the hurricane, posting photos of small branches shaken loose from trees on their Facebook pages and others complained of having to sweep up leaves. Progress Energy Inc.’s Brunswick nuclear plant in North Carolina also reduced its power output as Irene approached yesterday. All other US nuclear plants were operating normally and at full capacity, the Nuclear Regulatory Commission said. Fourteen nuclear plants from North Carolina to New Hampshire were in Irene’s path when the hurricane headed up the east coast on Saturday. 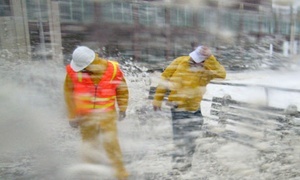 The shut downs and power downs cause widespread power cuts to some 900,000 customers from North Carolina to Massachusetts, which many New Englanders commented on in a tongue and cheek manner. “Mayday! It’s as bad as a thunderstorm,” wryly ran one Twitter. Virginia’s North Anna plant remains offline and cooled by diesel generators until officials there can restore power that was interrupted when relays on three large electrical transformers were shaken by Tuesday’s quake. This ultimately caused the reactors to shut down automatically. No release of radioactive material occurred beyond the minor releases associated with normal station operations, the company said. However, the opening of the relays interrupted electrical circuits carrying offsite power to run the two reactors’ cooling systems. The loss of power in turn scrammed the reactors offline. The relays are small switches used to protect the electrical transformers from damaging overloads.